This is the perfect gift for anyone celebrating a birthday or anniversary. 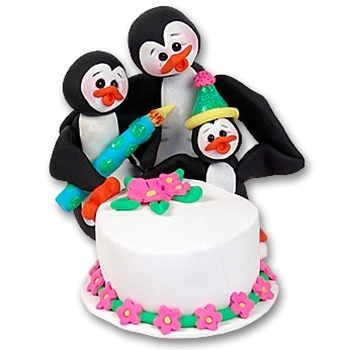 Little Petey Penguin is celebrating his birthday with his Family. The cake may be easily personalized with a name, year or event and as always, personalization is FREE! The ornament is lovingly handcrafted from polymer clay and designed by Debi Allison. This is a 3 dimensional figurine that may sit on a table or shelf. There is no hook for hanging.